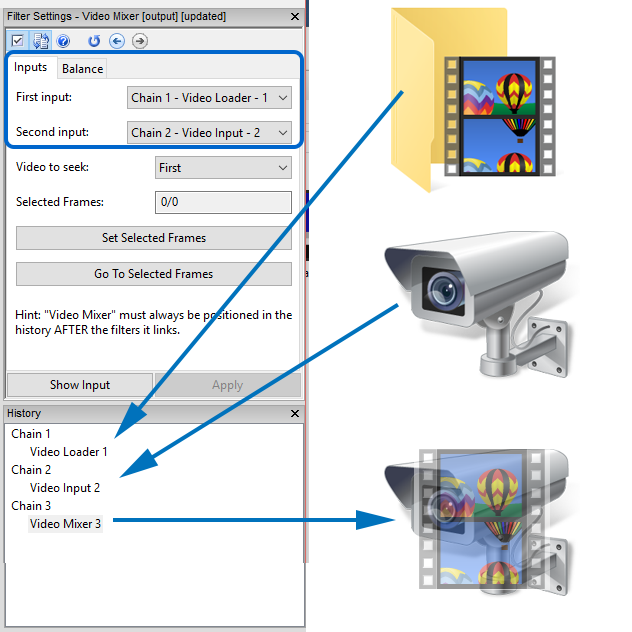 As illustrated in the graphic above, I have dragged a video file into Amped FIVE, and this action has automatically started Chain 1. I have then dragged in an Image file, which has created Chain 2. 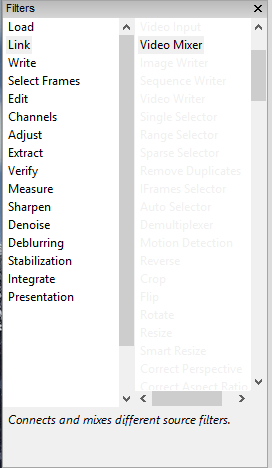 It’s then at this point, where I have selected the Video Mixer Filter from the menu. A new Chain is immediately created, that displays a mix of both Chain 1 and 2. The Chains to use for the mix can be selected in the Input settings at the top. Under the “Balance” tab is the weight of the mix, with the default being a 50/50 split. 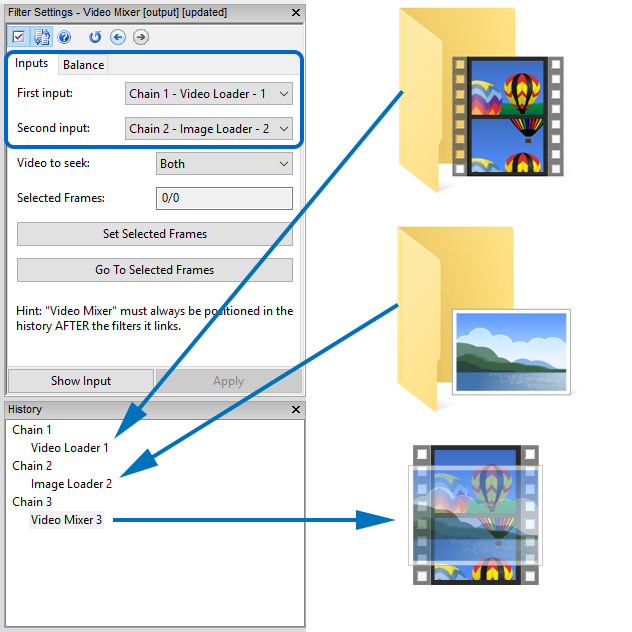 Whatever can be loaded as a chain, can be loaded into the Video Mixer. That, in itself, is quite handy but the real benefit comes from that fact that, if you have a number of filters applied in the Chain, you are able to select any of those stages as a video mixer input. 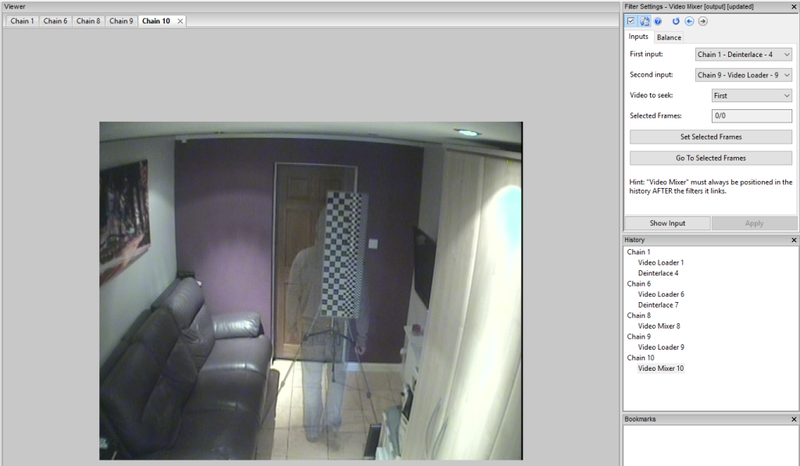 Furthermore, as it’s possible to use a real-time video feed, via any Directshow video source, as a separate Chain, you can now conduct many reverse projection techniques directly within Amped FIVE. 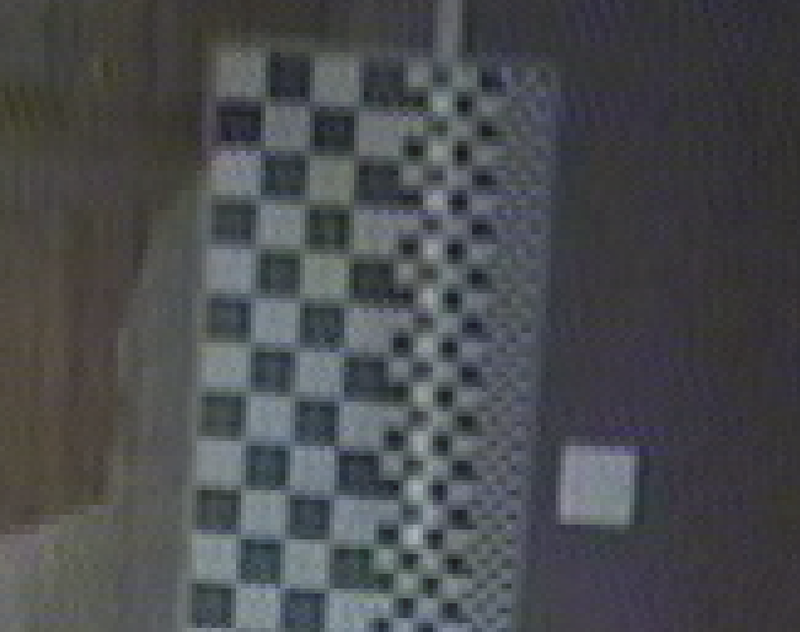 In the image above, my first chain shows a person walking away from camera. The video is interlaced so I have added a filter to deinterlace. In this instance I used Replication as I do not want to add in pixel values that were not captured. 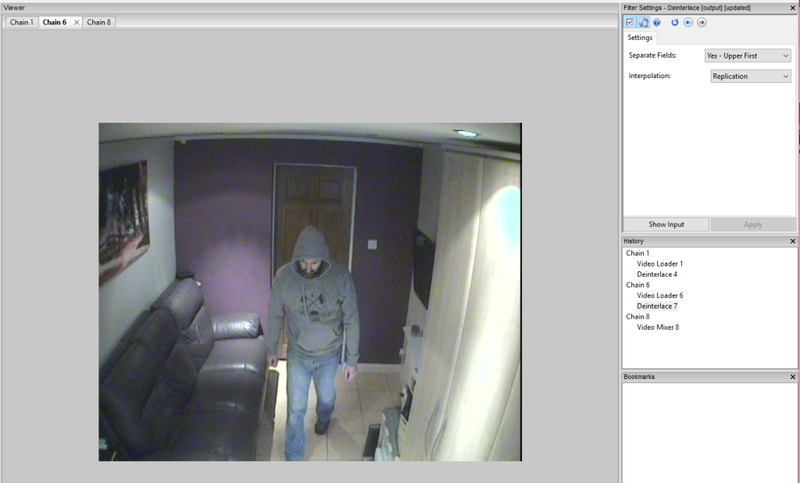 My next chain consists of another video clip recorded earlier. Again I have deinterlaced. 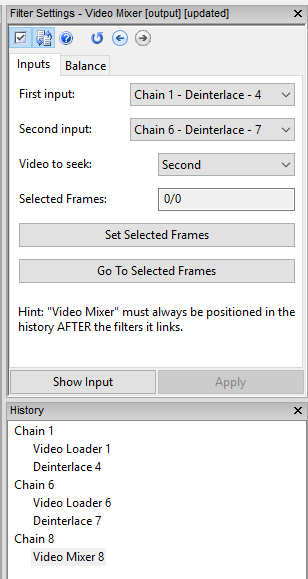 When I now add the Video Mixer, the two chains are mixed into a new chain…. As can be seen from the image above, this chain is now a mix of both Chain 1 and 6. Ignore the numbering (1& 6) – this is because during my testing, I have tested various other inputs, thereby creating chains that are no longer required! I could have kept them open but I prefer to clean away anything not needed. Taking a closer look at the settings, seen here on the right, you will see that both inputs are my chains after both Deinterlace filters. If I had a number of filters applied, I can chose which stage to use as input for the Video Mixer Filter. I have set my ‘Video to seek’ field to Second. When I scrub the timeline, the first input stays static. Now, you can probably start to think of many examples where this Filter may help you. 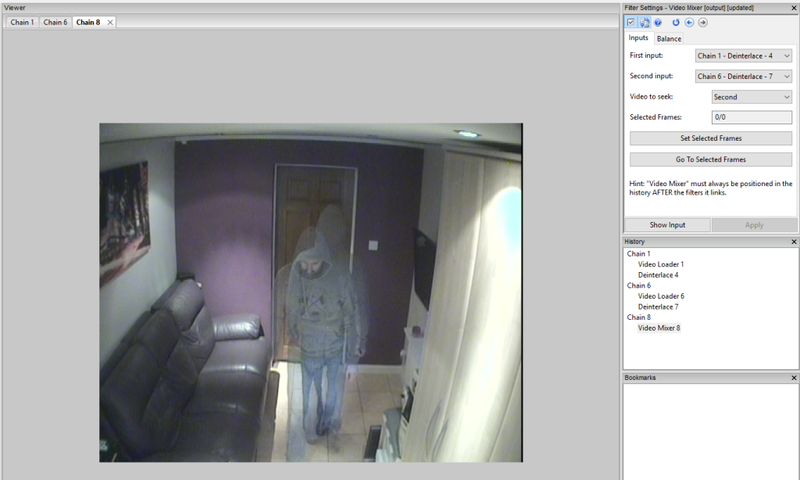 One of those, as I eluded to earlier, may be Reverse Projection Photogrammetry. In the instance above I have loaded another video of a cm height board. The one used here has 4, 2 and 1 cm squares. Obviously this would be adjusted and calibrated to a specific height. …but what about the placement of this height chart? At the scene, with my laptop loaded with Amped FIVE and a Directshow frame grabber, I am able to get a real-time view of the camera directly into a new Chain. This is visualized in the Settings graphic below as Chain 2 – Video Input. My first Chain is the original video. 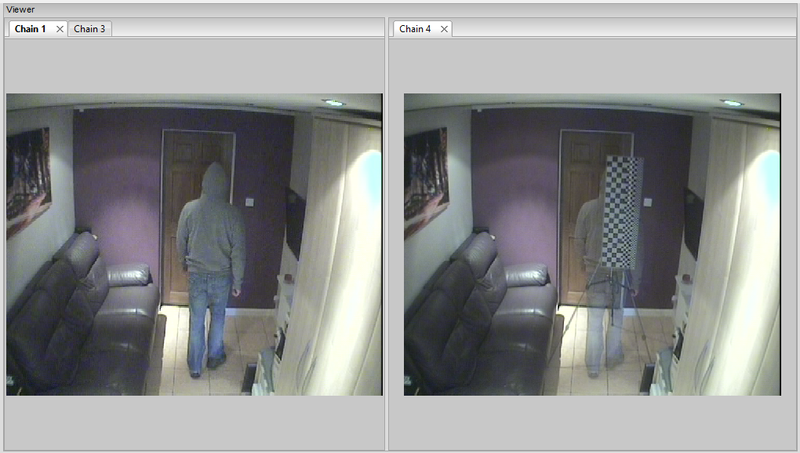 My second chain is the real time camera view. Using the ‘Video to seek’ option, I can jog through my evidential video clip to locate the frame of choice and then position the height board correctly. The flexibility of Video Mixer is where the tool really comes into its own. Being able to select the exact part in a Filter Chain, and use that as your input means that you can apply various filters to various chains and then preview those, mixed with other inputs. Remember also, with the ability to manage your window layout, you are able to preview a number of chains at the same time. In the example above, I have my two input chains in the first window, and my resulting chain in the second. It really is a tool that you have to experiment with. How about using the Video Mixer in conjunction with the 3D Measure Filter that enables single view metrology? 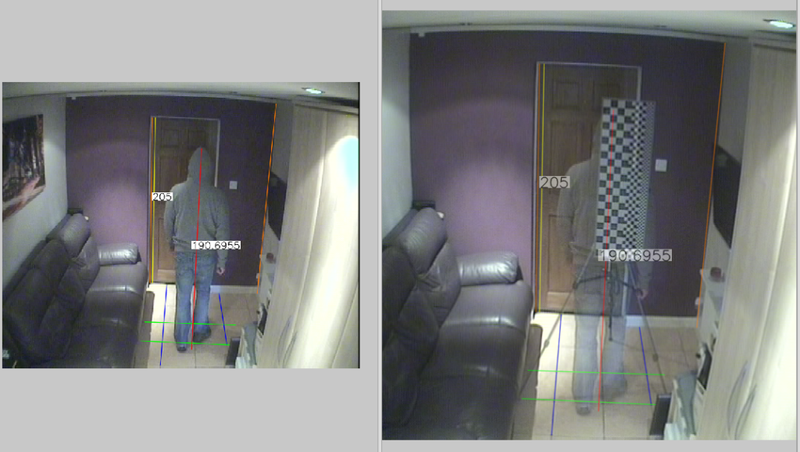 I’m currently testing some frame grabbers to use on-site when conducting reverse projection. When I have something to shout about, you will be the first to know. So, what are you waiting for…?